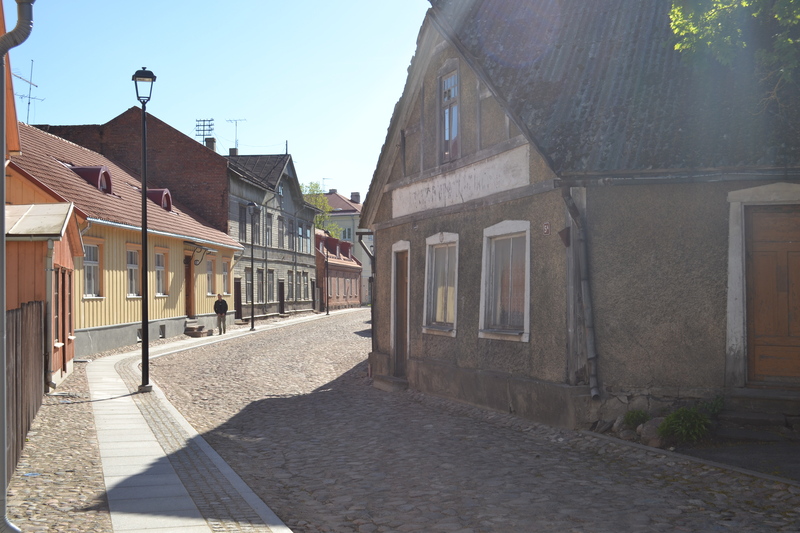 Viljandi would be my choice for the most attractive country town in Estonia, a nation that rather specialises in attractive country towns – Haapsalu, Võru, Kuressaare, Rakvere – all delightful, but none are quite Viljandi. It’s Estonia’s sixth-biggest city, a little dot in its south-western corner roughly equidistant from Lake Peipsi and the seaside town of Pärnu, an overwhelming rural area of a very rural country, made up of mile after mile of fields and forest, pocked by small lakes – Viljandi overlooks a respectably-sized one of its very own. And if there’s one thing I’d say about it, it’s that it seems to be a happy town. Almost everyone I meet here exudes contentment and enthusiasm to such a degree that I begin to be suspicious that I’m caught in a complex conspiracy to promote Viljandi. It’s a city very much defined, both geographically and atmospherically, by the adjoining lake, and at points sightseeing in the town simply seems a matter of finding the most beautifully framed slice of lake. It has a more than a minor effect on the climate as well: the closed-off cluster of colourfully painted mostly wooden buildings that is the Old Town is mist-wreathed and mysterious in cold weather, dazzlingly bright when the sun shines. It has a whimsical, handcrafted air, a tolerant, easy-going vibe, perhaps not unconnected to the presence of an artsy branch of the University of Tartu, and the annual, hugely popular folk music festival every July. A Viljandi local likened it to living in an Astrid Lindgren book, and I can see what she means – I think Pippi Longstocking would feel most at home at Viljandi, and I can imagine it would take her more eccentric deeds entirely in its stride. A number of others mentioned what a good place it is to bring up a family – and it is very noticeable that children are everywhere – a rarity in shrinking, ageing Estonia. The slogan Viljandi’s tourist board plasters over all the promotional material is “päris Eesti” – “real Estonia” – and this is hard to argue with; Viljandi is the heartland, a place that seems at points almost unchanged from the pre-war republic. If you could feel that you are in a time capsule at points in the Old Town, it does seem to be a spot that has caused confusion and memory loss to the many hostile forces that have swept through the area – it’s certainly been damaged, but never profoundly, inalterably transformed. The German aristocracy who controlled Viljandi are remembered as a more or less benevolent bunch – in contrast to the cruel autocrats found in some other parts of the region – and ones contributed greatly to the development of the city. The Soviet period, while being as traumatic as elsewhere in Estonia, had a peculiarly limited effect on Viljandi’s outwards appearance. Bizarrely, given that it’s one of the largest towns in Estonia, it apparently managed to escape having a statue honouring Stalin or Lenin, even during the most intense periods of repression. Conventionally, the central street in all significant Soviet towns was named after Lenin; in Viljandi, the name was never changed: the main street, Tallinna tee, points north to Estonia’s capital, as it always has. Viljandi is also strikingly unscarred by Soviet architecture – we’re reliably told at one point that there are just two buildings from this era in the Old Town; there are a couple of grey districts of apartment blocks on the edge of town, true, but even they have a rather half-hearted quality. Oddly, for such a peaceful, gentle town, Viljandi owes its current pre-eminence to a huge, hulking defensive fortress, whose ruins still get the best view of the lake. Viljandi fortress was first verifiably recognised by the outside world in the 12th century, on a map made by the Sicilian cartographer Muhammad al-Idrisi. Originally a defensive fortification for Estonian tribes of the ancient Sakala County, it fell, like the rest of the country, to German crusaders early in the 11th century. The German conquerors named the fortress Fellin (a name it would retain until Estonian independence in 1918), and quickly moved to strengthen their position by building strong stone buildings atop the Estonian stronghold. The fortress took a full two hundred years to complete, and at its peak was an intimidating and complex thing, with three moats connected by drawbridges, attracting the awe of foreigners – visitors from Prussia in the 15th century are recorded as saying they had never seen a more formidable fortress. To demonstrate its importance – in the 14th century Viljandi had 32 knights permanently resident in the fortress, compared to a mere 19 in Riga. Even Ivan III, the man who laid the foundations for the modern Russian state, was not able to take it, despite a protracted siege in 1481. Estonia did eventually fall to the Swedes, then later to the Russians, although for rural and inland Viljandi County the changes of government seem to have been registered less acutely than in more urban and coastal regions. Under the Russian Empire in the 19th century, Viljandi County did, in fact, become one of the more prosperous areas of Estonia: the historic region of Mulgimaa, in the far south of the county was famed for the wealth and astuteness of its flax-growing farmers, who became rich following sudden shortages as a result of the American Civil War. Efforts are afoot to resurrect Mulgimaa as a cultural region, and many well-known Estonians, including President Toomas Hendrik Ilves, have Mulk heritage. Even though its castle was not the last in Estonia to fall to invaders (that was Tartu – or Tharbata, as it was then), it is striking how effectively the city has managed to repel any profound attempts to change it, remaining as idiosyncratic and Estonian as it always has been. The first politically active Estonian-language newspaper, Sakala, started publication in Viljandi in 1878, quickly becoming the most popular publication among Estonians, the dispossessed majority of the population. Its editor, Carl Robert Jakobson, was among the most vocal and influential of the first generation of Estonian intellectuals, calling passionately for an end to the hegemony of the Baltic German aristocracy. Even during the 50-year Soviet occupation, it was known as an unusually free-thinking and unconstrained town, even for comparatively free-thinking and unconstrained Estonia, its festivals a draw for those disaffected by Soviet life – the hippies, longhairs and weirdos too odd for the collective farm. More recently, Viljandi was the home town of Mart Laar, a nationalist historian who was the intellectual impetus behind Estonia’s push for the restoration of its independence in the late 1980s, then became the resurrected state’s first prime minister. When you have views as preposterously fine as Viljandi does, any reasonably high building becomes a tourist attraction. The pine-green and red water tower is visible from most of the Old Town, rising above one of the city’s nicest squares. This is no longer the city’s functioning water tower – although you can see the significantly less attractive building that has taken that role from the top. There’s not a whole lot to do once you’re up there apart from look around, as the informative information is in Estonian alone, but it does have a pretty nice selection of pre-war photos of Viljandi. Viljandi Museum was one of the first dedicated town museums in Estonia, dating back to 1878 when an excavation of the castle ruins by local Germans took place. It’s helpfully chronological and each stage in the city’s history is neatly divided by dedicated rooms. We watch through the German and the Swedish and the Russian period, as Viljandi matures from a stronghold on the hill to a minor market town. It’s strong on the twenty years of the first Estonian republic, gathering together photos and artefacts to create a moving, possibly misleading sense of a bucolic, carefree time unique in the country’s history. It tails off after the first red year following the Soviet invasion in 1940, however, as if deliberating blocking out the horrifying memories. The drop to the shores of Lake Viljandi from the Old Town above is quite a sudden and steep one, making the townspeople’s journey from work to relaxation or fishing potentially very slightly troublesome and inconvenient. To improve the situation, in the late 19th century, 158 steps were constructed to connect the two areas – indeed, in Estonian, Trepimägi means, literally, “stairs hill”. For understandable view-related reasons, this slope was considered one of Viljandi’s most prestigious locations to build a house, and so over time a number of expansive buildings have been constructed alongside Trepimägi; when you reach the bottom, you can look up onto a scene of pleasant chaos – buildings made up seemingly entirely of mansard roofs and expansive balconies elbowing each other for prominence. The real reason for Viljandi’s existence, and still in possession of the very finest of Viljandi’s views of the lake. The remains of the castle stand on a hill a five-minute walk from the Old Town and despite their sadly denuded state – only one full wall remains, and that is pocked with holes – are still an atmospheric place for a wander. The once-formidable castle effectively ceased functioning as a working fortification after sustaining serious damage during the Polish-Swedish wars of the 17th century. The following centuries reduced it still further, as the site was frequently resorted to for building materials when the town was growing fast, between the 18th and 20th centuries. Consequently, the experience requires a great deal of imagination now, but it’s still an evocative and pleasant place for a walk on a hot day. Don’t leave it at the lakeside view and the scattered ruins, though; the woods around are wonderful for a ramble in spring or summer. Deep trenches dug to aid defence hundreds of years ago have produced a quirky and unusual surrounding landscape. Valleys are scored deep into the hillside, which fill up with flowers and greenery in the warmer months; these protective gorges have also necessitated the building bridges to link the upper levels – the most picturesque being the miniature, bright-red suspension bridge that leads to the ruins themselves. A statue of Johan Laidoner, three times commander-in-chief of Estonia’s armed forces between the wars sits at the bottom of the hill, looking not so much inspiring as sadly determined. Paul Kondas (1900-1985) was one of the last century’s Viljandi characters: a dedicated teacher and musician, who pursued painting as a hobby. Despite a clearly considerable knowledge of culture and art, he’s considered a “naïve artist”. There is a certain lack of sophistication perhaps – faces tend to be crayoned ovals, and wonky, two-dimensional shapes and off-beat shadows predominate – but this only aids him in creating a childlike world, where menace and wonder are hard to dissociate from one another. A wartime Dresden scene full of static explosions and people leaking blood is particularly distressing, while others are more ambiguous in their meanings: one of his final pictures, far from atypical, shows Father Christmas on a winter lake in a fishing boat, only a Christmas tree for company, backed by a ghostly blur of blue, black and white trees. This final detail shows that these pictures are not as oblique and apolitical as they seem: Kondas lost one of his teaching jobs due to an alleged lack of interest in ideology and frequently worked in the colours of the banned Estonian flag into his pictures. Other pictures, though, catch something of the sleep-deprived ecstasy of the few, stretched Estonian summer days, full of figures engaged in collective, faintly insane activities; the dour colours of others capture the anhedonic winter flipside. The centre puts on regular exhibitions of naïve and outsider art from Estonia and elsewhere, and the helpful staff are founts of information about Viljandi. Long-distance running is the perfect sport for the – stereotypically – solitary, industrious Estonians, and one of the things Viljandi is famous for in Estonia is the Grand Race Around Lake Viljandi, a 12-km route which takes place on May 1st. It first took place in 1928, and has been held every year since then. This year’s winner, competing against 3,281 others, managed to do the whole thing in just over 36 minutes, but we don’t think this is the most enjoyable way to experience the lakeside circuit. If you walk it, it’s more like two and a half hours, and apart from a couple of short stretches following main roads, the path passes through the beautiful, mostly deciduous forests of the area, skirting farmland and marshes at points. It’s more than worth all the effort for the view of the town from the opposite side, especially when lit up in the evening. During the first period of independence, there was a restaurant out there on the sparsely-populated far shore near Sakala, its customers rowed from across the lake, which is spoken about in nostalgic and wistful tones by those who could not possibly have remembered it. August Maramaa, mayor of Viljandi between 1919 and 1921, and then again between 1927 and 1939 is remembered fondly by most in the town, not least for his insistence that Viljandi should be an attractive, park-filled kind of place. If we understood the story related to us correctly, he was a dog lover and an avid walker, who took a meditative walk around the town every evening at the same time, following the same route. One of his dogs was, apparently, purchased specially from Germany, named Treff von Felzengrau – obviously – but, for unexplained reasons, “only understood” English (we assume only responded to commands in that language) The really rather peculiar statue by one of the attractive parks that is his legacy features the bald Maramaa bending down, walking stick in hand and a sickle-shaped, slightly creepy smile on his face, looking down at a dog lying obediently on the ground before him. Pay close attention at the corner of Lossi tänav and Tartu tänav, opposite the Eve restaurant, and you’ll see a plaque commemorating a spontaneous caricature session that took place during the Nazi occupation in 1941. Three talented cartoonists resident in the town offered to draw anyone who requested it. Valtman is the best-known of these figures, and also the luckiest, managing to escape the country after the second Soviet occupation in 1944, and after three years in a displaced persons camp, made it to the US, subsequently becoming the chief political cartoonist for the Connecticut newspaper The Hartford Times. Passionately anti-Communist due to his wartime experiences, caricatures of the contradictions and absurdities of the Communist societies of China and the Soviet Union were especially savage, and he became a recognised and respected figure, winning the Pulitzer Prize for Editorial Cartooning in 1962. He even sometimes managed to draw attention to Baltic issues, concerns considered at best far-off and obscure by his readers – one 1979 cartoon, entitled “The Man Who Came to Dinner” addresses the Soviet exploitation of Baltic resources and food supplies by way of a giant, grotesque uniformed figure sitting in on a modest meal between a poor Estonian couple. For reasons that no one is quite able to explain, Viljandi continues to supply a disproportionate number of Estonia’s premier cartoonists. Why not write a follow-up on the Cultural Academy of Viljandi (branch of Tartu University), so active and important, not only for Estonia?